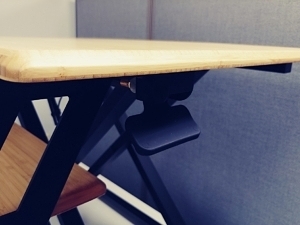 The Cooper is Fully’s debut into the competitive world of standing desk converters. While it doesn’t break any new ground, quality components and an eye-catching bamboo surface option make it stand out from the rest. Lack of ergonomic tilt on the keyboard tray means it doesn’t check all the boxes, and we have some concerns about reliability when coupled with the short two-year warranty, but overall the Cooper is a respectable choice. Bamboo option gives it an aesthetic edge over competitors. X-lift design saves space, and height adjustment is smooth and easy. Counterbalance is adjustable with an Allen key. Feels very polished overall. Lack of a tilting keyboard tray is not ideal for standing ergonomics. 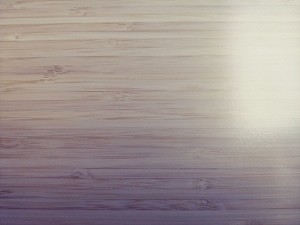 Like the Fully’s Jarvis Desk, the bamboo finish is still advertised in a way that implies it's an environmentally-sensitive choice when the truth is the opposite. Makes noise while changing height, and the greased slide track is exposed to air and dirt so periodic cleaning and re-greasing will likely be needed. Single gas strut versus dual struts in other units is a reliability risk, hinted at by it's relatively short two-year warranty. The Cooper is a well-made product overall, featuring an elegant bamboo work surface not seen on too many other standing desk converters. It’s easy to operate and feels like it’s more than the sum of its parts. While not without its faults (chief among them the lack of an ergonomically tilting keyboard tray), the Cooper has worked its way into the premium stable of Varidesk alternatives. Fully.com, known for their popular Jarvis standing desk, has entered the arena of standing desk converters with the Cooper—and it’s a handsome kid, indeed. While their design doesn't necessarily break any new ground, the Cooper exemplifies how far converters have come since the introduction of the Varidesk in 2013. 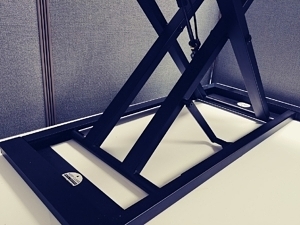 There’s no one key feature, chart-topping spec, or any specific innovation that we can single out, but rather the overall package that makes the Cooper a very viable stable mate along with other popular incumbents in the X-Lift and Z-Lift standing desk converter categories. At its current price point of $325 the Cooper should appeal to a wide variety of users. The price is roughly on par with other quality-made X-Lift models like the Flexispot M2B, and $25 more than the ZipLift (a Z-Lift model) that also features a tilting ergonomic keyboard tray and included portable anti-fatigue mat. Aesthetically speaking, the big pop is the Cooper's attractive bamboo surfaces. Fully’s merchandising copy claims that they could not find a product that had everything they wanted in a converter, so they decided to build one themselves. 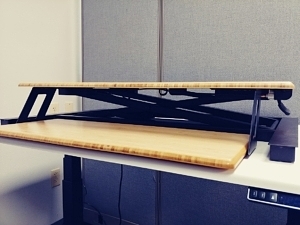 This partially refers to their positioning as an eco-friendly manufacturer, but in terms of features, the Cooper doesn’t really add anything new to the standing desk converter world, it's just their house brand variant that they can call their own. And as you'll read below there's quite a bit of greenwashing going on with the ecology pitch. The good news is that the features that are present work well—which is more than can be said of just about every cheaper converter we’ve tested. Even at $325 you will get what you paid for. First thing’s first: we love the Cooper’s large work surface Approximately 35” x 20” of space to work with should be more than enough to accommodate most people’s usual desktop setup. This is the only size offered, so if you find that 35” isn’t wide enough for your needs, you’ll have to look at wider-set models like the Flexispot M3, ZipLift HD or Varidesk Exec 48. It feels moderately stable to type on, but there is a little bit of give where the work surface and keyboard tray attach to the frame. It's a shame, because while the frame itself feels remarkably solid, but you do notice a definite give when you attempt to push the work surface front-to-back or side-to-side. The X-lift mechanism comes with both positives and negatives. It’s smooth and easy to operate, due to its quality construction and components. Unlike Z-lift converters, the Cooper lifts straight up and down, like an ironing board. This is a nice feature for those working in tight spaces. The downside to this mechanism is that the Cooper produces an annoying noise when you adjust the height, resulting from the alignment guides at the bottom of the X rubbing against the frame parts as they move. It’s not nearly on the level of cheaper Amazon-only desk converters that we’ve reviewed, but it is noticeable. It's not as bad as the clanging springs on a Varidesk but it isn't completely silent like a ZipLift, either. See our video below for a demonstration. A bigger issue than the noise, though, is that the base of the X-lift is greased to ensure a smooth height adjustment. 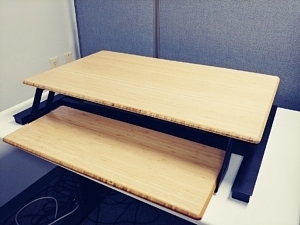 While effective at damping the motion when raising or lowering the desk, it also comes with the downside that the greased areas are completely exposed, and will collect dirt and dust over time that will no doubt need to be cleaned out and re-greased periodically. This is the one drawback that could be a showstopper for some consumers. The final knock against the X-lift design is that it invites more pinch points (places where your fingers could accidentally get caught). Users with small children or "desktop cats" walking around will have to take extra precaution to avoid this danger. The X-Lift design lends itself to more pinch points as it collapses down. 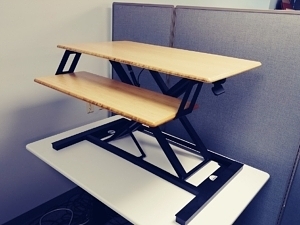 An aesthetic disadvantage of the X-Lift design approach is that head-on (as in the photo above) you see a lot of superstructure, including the bottom frame, which extends wider than the desk's work surfaces. That might look cool in a converted loft office space with lots of exposed beams and ducts but it definitely detracts from the Cooper's otherwise svelte design style. It looks a lot nicer when it's lowered to the sitting position. Z-Lift devices have their linkages on the left and right side of the unit. On the Varidesk they're kind of exposed but on other units like the ZipLift they're nicely hidden behind covers (which also provide protection from potential pinching). Here's where the Cooper has something on all the other X-Lifts and Z-Lifts that we've tested so far. The tension level on the Cooper’s air-piston counterbalance is actually adjustable. This gives it a bit of an edge in the market, but as a somewhat “new” feature, it’s definitely not perfect. It requires a surprising number of turns of your Allen key to make any difference—you probably won’t notice anything with less than five—and you have to reach into the center of the frame while it’s extended to get to it in the first place. Additionally, the Cooper is supposed to come with an Allen key for adjustment, but it was missing from our unit so we had to fish around the tool bench for one that fit the bolt head. We'd like to see more standing desk converters offer an adjustable counterbalance, especially since so many people who switch to standing desk converters suffer from low back pain. It would help in both the very lightly-loaded, laptop-only scenario as well as the heavily-loaded, dual LCD display on monitor arms scenario. With other units it just means that the user has to assist the unit a little bit during height changes, pushing down a bit harder when it's lightly loaded, or assisting with the lift if it's heavily loaded. This isn't a problem for 99% of users but for the 1% with very serious lower spine issues the Cooper might be the go-to choice just for this one feature. The nice thing with the Cooper's X-Lift design is that there's only one piston to adjust instead of the two that you'll find on Z-Lift units that utilize gas pistons (e.g. FlexiSpot and ZipLift). Taking the long view, though, a single strut is a potential single point of failure, and just like having two engines on an airplane, the redundancy and load sharing of having a strut on each side of the desk is an advantage of Z-Lift designs as the years go by. 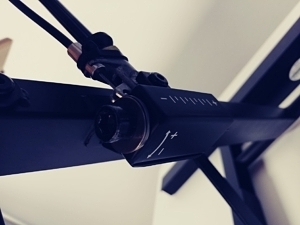 With the Cooper's relatively short two-year warranty this is a bit of a concern, so if you're looking for maximum reliability you might want to place greater consideration on Z-Lifts with five year warranties like the iMovR ZipLift and Flexispot M2B. Finally, and most disappointing to our ergonomics experts, is the keyboard tray. The bamboo version may look nice, but like most standing desk converters in this price range it lacks the ability to tilt. 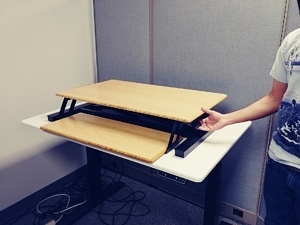 Standing while typing on a negatively tilted plane reduces strain on the wrists and elbows, and many other top standing desk converters have this feature. A flat keyboard tray isn’t the end of the world, but it’s a missed opportunity to help prevent RSIs like Carpal Tunnel Syndrome. Perhaps future version upgrade of the Cooper will be more ergonomically refined. 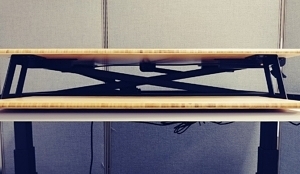 The keyboard tray rests above your desk surface by about an inch. Thick foam pads on the bottom of the tray protect it from touching your desk, which would otherwise happen when you press down on the tray (i.e., when you type while sitting down). The Cooper actually feels slightly shakier to use while sitting rather than standing as it bounces into your desk. This seems to be caused in part by the foam strip spaces underneath the keyboard tray that are there to protect your desktop for getting scratched by exposed screw heads from the bracket hardware. We were surprised to discover that the instructions for the Cooper are written on the inside of the box. There’s no separate manual included with the product. While this has a nice eco-friendly touch, it does mean that if you ever plan to throw the box out, you won’t have a physical instruction manual left over. Luckily, the Cooper is easy to operate and this should not cause any problems. Aside from that, the product works right out of the box with no assembly required. Some users have reported that the tension needs to be adjusted out of the box (to be expected if they have very light or very heavy desktop accouterments) , but for our purposes, the tension did not have to be adjusted immediately. One thing to keep in mind is that the Cooper is pretty heavy at 43.5 lbs (or 49 lbs for the black version), so it might be a good idea to have a friend help you get it set up. The Cooper is a sleek looking converter. From smoothly beveled edges to the clean lines of the frame and matt-finish powder coated metal, it’s the little things that come together to make the Cooper so dapper. Even the logo emblazoned on the rear left of the base is subtle enough not to detract from the product’s modern aesthetic. 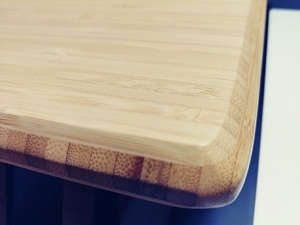 It comes in both black and bamboo work surface finishes, but the bamboo is the clear winner in the looks department. In fact, the bamboo is the reason that many people will be drawn to this product in the first place. But it might not be exactly what you expect. Online standing desk sellers like Fully, UpLift, Autonomous, and others have long been spinning marketing claims that their bamboo desktop options are the most environmentally sensitive choice for today's desk buyer, when in truth it's the exact opposite. Portland, OR-based Fully holds itself out as a good environmental steward in its product design choices but in the case of bamboo desktops they attempt to dupe the consumer just as as much as their competitors do. Like their bamboo standing desk competitors, Fully focuses on the famously rapid growth rate of bamboo stocks and doesn't mention the environmental devastation occurring in China from the displacement of healthy mixed-forest ecosystems with monoculture moso bamboo farmers, poisoning of the water streams and a decline in plant, insect and animal species in these bamboo-growing regions - all in the name of chasing economic growth. They never discuss the immense amounts of power, glues and chemicals required to convert flexible cylindrical grass tubes into hardened desktops. Bamboo is indeed a beautiful grain, and it's very inexpensively made thanks to how fast it grows, but it is literally the worst choice an environmentally-conscious consumer can make when it comes to choosing a desktop. 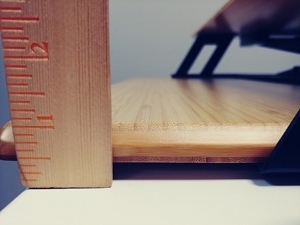 Get the full story by reading our detailed report on Bamboo Standing Desks – Separating Truth From Fiction. The Cooper is very new so there aren't a lot of verified buyer user reviews on it yet, but initial reviews have been mostly positive. Many have noted that the Cooper is a great choice for taller users, which makes sense considering not only its max height of 22", but also its stability at that height. These couple of extra inches over the competition make the difference for those on the taller side, with one user reporting in at 6'7" with a positive experience. One user on Amazon commented about the lack of keyboard angle adjustment and that the gap between the keyboard platform and the upper work surface is so small as to sometimes cause him to bang his knuckles against the sharp edge of the top surface when mousing around. 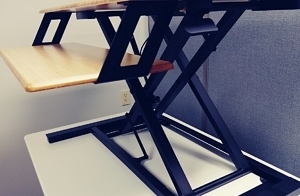 Despite its flaws, the Cooper is a strong choice as compared with most other standing desk converters on the market. It boasts not only a sleek design, but also the functionality to back up its good looks. It lacks a tilting keyboard tray and we worry about the longevity of its single gas strut and dirt-prone lifting mechanism when considering it's relatively short two year warranty, but overall the Cooper should please the majority of its users. At a middling price point of $325, the Cooper may end up becoming a popular alternative to the antiquated and overpriced Varidesk Pro 36, but it'll have to work harder to bounce other incumbents like Flexispot and ZipLift out of that contest. Just don't let yourself get bamboozled by the ecological pitch, it's no hero in that department. Note, the original price of the Cooper was $290. While most products in the office fitness category go down in price over time, the Cooper was likely impacted by Chinese tariffs imposed in October, 2018. 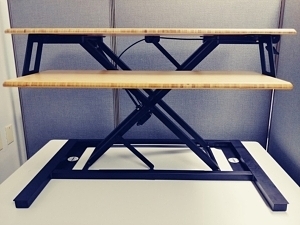 For more reviews like this, check out our Best Standing Desk Converter Reviews. For more information on our review process, click here.